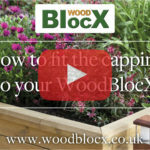 The key thing to make sure you don't damage your WoodBlocX is to use one of the spare BlocX or a spare bit of wood to hammer on the capping. This makes sure you don't dent the capping when your fitting it. All you need to do is start at one end of each piece and work your way along.